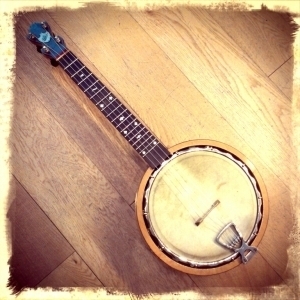 Just about to return to its owner after a spell in our workshop, this lovely Keech banjo-uke -such as one might have found in the hands of Mr George Formby back in the day- has been a pleasure to get to fiddle with. It was really sturdily made, but time had caught up with some of the tension hooks, which we were able to replace from our trusty spares selection. The neck angle needed resetting, and a fresh set of Aquila strings brought the best out of the instrument. Most fun to take apart was the weird belt-and braces resonator system: the head sits on a sturdy metal rim, then an internal resonator also functions as a flattop-style tone-ring to really crank the head tension, THEN a second resonator is bolted on the back. Bonkers, but it’s super loud!